W S Harrison & Son Funeral Directors provide dignified, respectful funeral services to the local community. We take pride in helping families celebrate the lives of their loved ones. We will always go the extra mile to ensure your loved one receives a fitting service. As part of Dignity, you can rest assured in the knowledge that your loved one will be in the care of dedicated professionals. We take care of every individual as if they were a part of our own family, helping us to provide a consistently high quality of care. 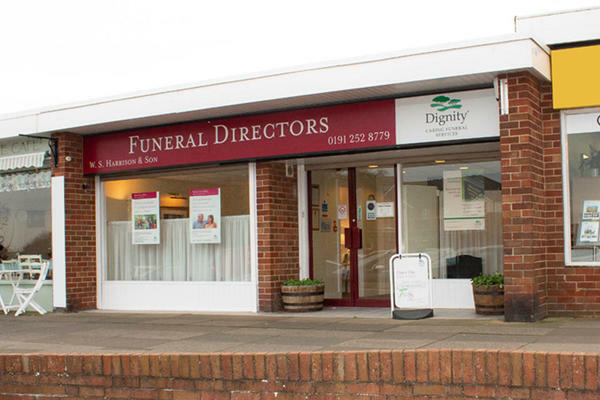 Our funeral home in Whitley Bay is easy to reach from the surrounding areas of Monkseaton, Old Hartley, Holywell and Shiremoor. Please call us as soon as you need our assistance, we are always here to offer you our support. You can contact us by telephone 24 hours a day, whenever you need us most. At W S Harrison & Son Funeral Directors, we understand how special life is with those that you love. For us, every funeral is unique and personal. We have a service to fulfil every wish, with every detail carried out with the same uncompromising quality of care. From a traditional service, to a colourful woodland burial, your options are limitless with our Full Service Funeral. If you have a little more flexibility when it comes to arrangements, then we can provide a Simple Funeral for a lower cost. Car parking is available at the front of the funeral home within the shopping centre. We are situated within the Whitley Lodge Shopping Centre, near Tesco and the Kittiwake public house. Our staff are available 24 hours a day on 0191 252 8779 if you require our services outside of these hours. What I thought was going to be a difficult time was made comfortable by the caring help of the staff from the beginning to the funeral and beyond. Thank you for taking the time to share your thoughts with us. I am pleased that you were so well looked after by our team and that we were able to help make things easier for you at such a difficult time. Excellent service from the whole team. They were the first people I contacted after the death and really made me feel so supported and cared for. They were respectful, gave time and space to us and kept in contact with me through the process. I couldn't recommend them more. Thank you for sharing your thoughts with us on your online review. I am glad that we were able to provide you with the care and support needed at this time. Thank you for your online review. I am pleased that you were so well looked after by our team and that all of the arrangements were carried out to your satisfaction. Everything was perfect and meticulously arranged. Robert our funeral director showed great care and concern throughout. We were impressed with Dignity, the 'extra' special touches made us feel that everything was personalised, especially the memory book and card, something for us to treasure. Thank you for the kind comments posted on your online review. I am pleased that you were so well looked after by our team and that all of the arrangements were carried out to your satisfaction. The care and attention to detail from the first phone call to the actual funeral and the after care was excellent. The staff were friendly and caring and when visiting the chapel of rest we felt that our lost loved one was treated with care and respect. We were given time to say our goodbyes in a lovely way. The memory book we received after the funeral was of great comfort to us. Thankyou to all the team at W.S Harrison and son. Thank you for the kind comments posted on your online review. I am pleased that we provided the highest level of care and guidance for you and your family and that we were able to help make things easier for you at such a difficult time. Excellent service, everyone we came into contact with was professional, caring and helpful. We would certainly recommend W S Harrison & Son to anyone who is looking for an excellent service. Thank you for sharing your experience with us on your online review. I am pleased that we provided the highest level of care and guidance for you and your family and that all of the arrangements were carried out to your satisfaction. With all of the things you need to organise and worry about during tough times, arranging the funeral was not one of them. Great communication, respect and guidance throughout the process. Really accommodating to those last minute additions and requests too. They did my father proud. Thank you for taking the time to send your online review to us. I am glad we were able to provide you with the support and guidance needed and that we were able to help ease any worries that you may have had. I would not hesitate in recommending this company. Their service was above and beyond my expectation. They treated myself and my family with such care and compassion. Thank you for taking the time to send your online review to us. I am glad that we were able to provide you with the care and support needed and that we were able to help make things easier for you at such a difficult time. Staff at Whitley Lodge branch were incredibly professional and respectful throughout the process. They dealt with my late husband with care and compassion and supported me at every step. It made a very distressing situation easier to deal with. Thank you for taking the time to complete the online review. I am glad that we were able to provide you with the care and support needed and that we were able to help make things easier for you at such a difficult time. A dignified and professional service was provided at all times. Thank you for posting your online review. Everything was conducted in an efficient yet pleasant and considerate manner, reducing much of the stress from a difficult time. The advice on pricing was much appreciated and a pleasant surprise in view of recent television publicity. Thank you for sharing your experience with us on your online review. I am happy to hear that we were able to help ease any worries that you may have had and that all of your wishes and requirements were carried out by the team as you had requested. I cannot thank them enough for the service they have provided for me and my family at this most difficult, confusing and highly emotional period in our lives. Each member of this team have been proffessional, kind and curteous and I always felt went that they went out of their way to accommadate our needs and to offer advice. This is always a difficult time but there are periods in the grief that laughter helps, I found the team were able to strike that balalnce for us. They also provide excellent aftercare and you have the option of popping in any time for a chat and a cuppa, that is so welcome and comfortating to know that and that it is meant. A wonderful team of people. Thank you for the kind comments posted on your online review. I am pleased that we were able to look after you and your family at this difficult time and that we were able to provide you with the care and support needed. We found Dignity excellent from start to finish for my father's funeral. From the initial first meeting to interring the ashes. We were kept fully updated throughout, nothing was a problem. Rob was fantastic, very friendly and reliable, we felt extemely reassured throughout the process. We were very impressed with the memory book provided after the funeral, it was very well thought out, well designed and Rob made sure he didn't miss anything out, it is a lovely sentimental keep sake and something we didn't expect. Rob also arranged and attended the interrment of the ashes, he really does go above and beyond to help people during a very difficult time. We would not hesitate to recommend Rob and his team at Dignity to our family and friends and can not thank Dignity enough for everything they have done for us. Thank you for taking the time to send your online review to us. I am pleased that you were so well looked after by our team and that all of your wishes and requirements were carried out as you had requested.